Great price for product, bought as gift for sister she still wears it and receives many compliments. 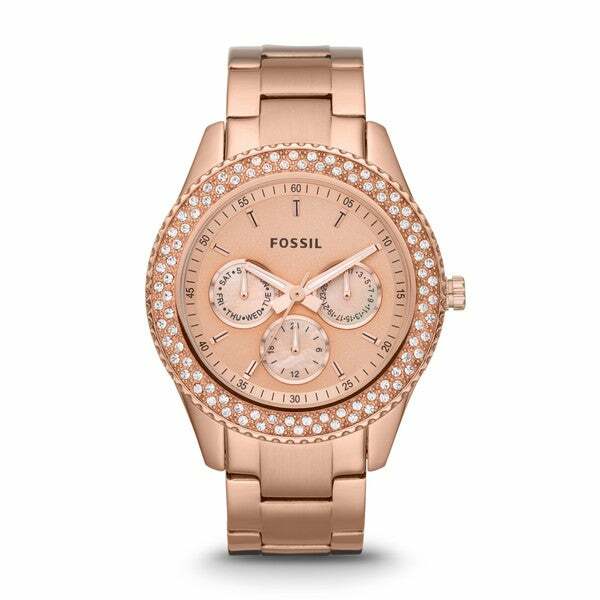 This classic timepiece by Fossil features a rose gold tone stainless steel case and bracelet. A pink dial, precise quartz movement and a water-resistance level of up to 50 meters finish this fine timepiece. Love love love this watch! I get so many compliments on it and people are always asking me the brand. They are surprised to find out its not one of the more expensive brands. I'd venture to say this is nicer then some of those high end boyfriend watches! The watch is awesome and it was a great gift. The only reason I didn't give it a '5' star rating is because the battery was dead when we got it. It looks better than the picture. I love this watch. Great looking watch and shipped right away !! this was simply amazing beautiful. I wouldn't buy the product again only because u wasn't crazy about the color. But the style is beautiful. Its a pretty watch and Im looking forward to getting it! "There are two different watches in the image gallery. Which one would I receive?" This watch is ALL rose gold. not the yellow face.